This report highlights the real and perceived conflicts of interest among regional Banks’ boards that came to light during the financial crisis, and which persist today. The findings suggest the Federal Reserve must address the composition and diversity of its leadership while also improving transparency and accountability mechanisms. 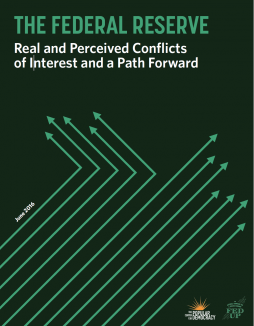 This report offers a series of concrete recommendations to mitigate conflicts of interest and ensure the Federal Reserve more fully represents the American public.